Brrr… it’s cold out there! Winter is here and it’s time to start taking extra precautions to stay warm and safe when the weather gets cold. Did you know there are precautions you can take in case of a winter-weather emergency while you’re on the road? Read on to find out! This winter, everyone should keep a Winter ICE Kit (pun intended) in the trunk of their car in case of emergency. This will come in handy in case of a breakdown during extreme weather conditions of cold temperatures. Recommended items to put in your ICE kit are: a flashlight, road flares, high-energy snacks like trail mix or beef jerky, bottles of water, a first-aid kit, blankets, toboggans/gloves, a bag of kitty litter or sand (can help you get unstuck from ice/slush), an ice scraper and a small shovel. You never know what could happen and it’s best to be prepared! 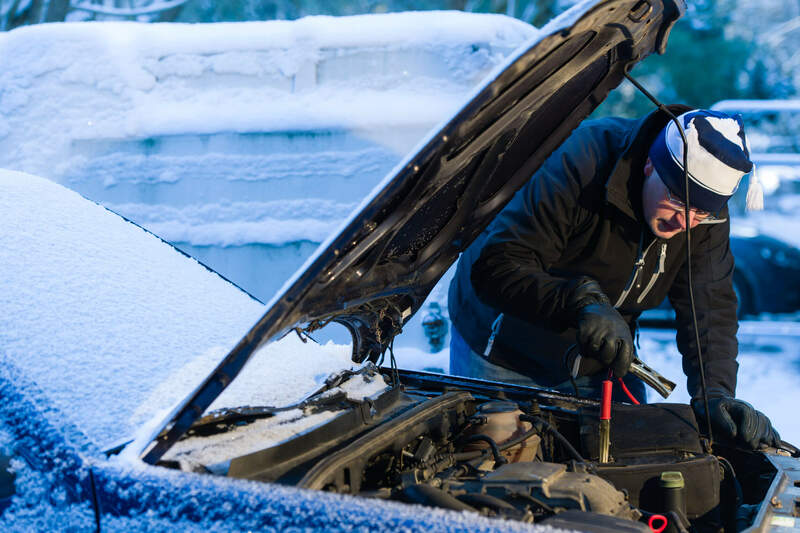 With the temperatures dropping, your vehicle fluids run the risk of freezing up inside of your engine if not monitored and replaced correctly. Coolant is the biggest threat in this category, as it needs to consist of a 50/50 mix of water and antifreeze. Also, windshield wiper fluid is often overlooked and a=can freeze up inside of its tank, leaving you without a clean window to see out of when you drive. For places that drop below freezing, it may also be necessary to switch your car to a winter-grade oil. Consult with your mechanic to see if this is a good idea for your car this winter. You may be forced to rely on your tires more than ever in a winter storm. In order to safely travel on slippery wet roads, your tires need to be inflated to the correct tire pressure and they need to have the correct tread depth. Check with your mechanic to see if your tires are safe to drive on! There’s nothing more irritating than going to start your car and finding out that something is wrong with the battery. Keep in mind, the cold hinders functionality of several vehicle components, the battery being one of them. Check to make sure all terminals are snug, and your battery fluid level is ok. It’s also important to make sure your battery has a good charge, and isn’t around 4 years old. The average battery needs to be replaced after 4 years of use! The best winter preparation you can do this year is stay inside and stay safe when the weather gets scary, but we know this isn’t always possible. We hope you winterize your car and stay safe and warm this winter season!